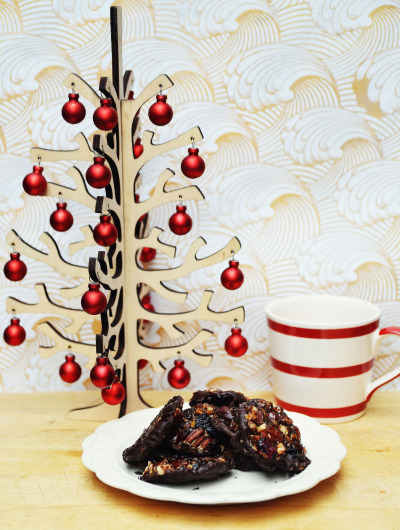 EAT: Hazelnut, Pecan & Sour Cherry Florentines. / papillon. I always have to laugh when I end up with photographs like the above, like I’m some super organised set-dresser, when the whole time I was making these florentines I was plastered in chocolate with chipmunk cheeks full of caramel off-cuts. My technique leaves something to be desired, though the outcome was pretty great - these are adapted from Booths Christmas 2013 magazine, which was very! insistent! that I shouldn’t leave the caramel base to cool before cutting them into rounds. In fact, if you bake them for only 10 minutes you’ll have less brittle, more chewy florentines, which are much easier to cut when cooler (I lie face down on the kitchen floor in a sticky sugar coma so that you don’t have to). This is my first bit of Christmas baking for the year, actually, and I think I got all the important bits in - spices and caramel and toasted nuts and dried fruit, with a dark, sweet snap of chocolate. Excuse me while I eat florentines for breakfast for the next few weeks. Spread the nuts out on a baking tray and toast in the oven for about 6-8 minutes at 180C (350F) until fragrant. Then whizz half of them in a food processor until roughly chopped, keeping the other half whole, and set aside. Heat the margarine, sugar, spices and syrup in a saucepan over a medium heat until melted together, then remove from the heat and stir in the flour. Line a large flat baking tray (for me, that’s a full-size Aga tray, 44 x 34cm) with greaseproof baking paper, and pour the caramel mixture over it, smoothing out with a palette knife until it’s even thickness. Cook for five minutes at 180C, then take out and scatter with the ground nuts, whole nuts, and cherries. Bake for 10 minutes longer, until the colour has deepened and is bubbling. Let the mixture cool - this is hard to judge, as you want them to be holding their shape but not have hardened so much that you can’t cut them. If you’ve only baked them for 10 minutes, though, I think you can get away with letting them cool a little more. Using a cookie cutter and working in from the edge, cut out 20-25 rounds and put them aside to cool as you go. 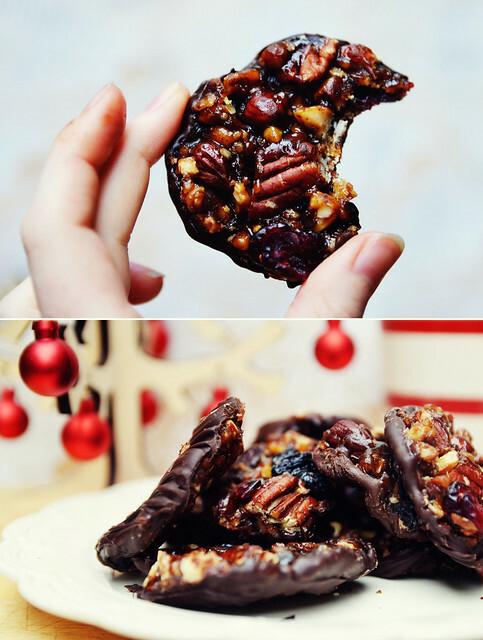 Once the florentines are completely cool, you can melt the chocolate (I use the microwave, because I am lazy, but be careful to melt is slowly and not burn it) and dip the chilled cookies in it. Turn them caramel side-down to cool this time and leave in the fridge until the chocolate as set and turned matte. Christmas cookie time starts now.